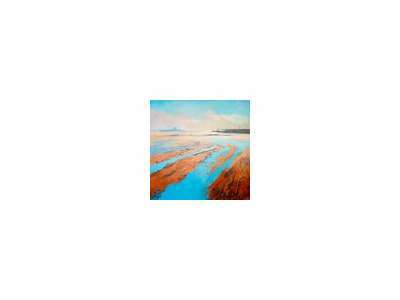 Martin Bullivant is a contemporary marine, landscape and abstract artist. His work is in international collections in the Channel Islands, UK, America, Australia, Spain, Hong Kong, Switzerland, Bermuda, South Korea and New Zealand and beyond. Martin Bullivant is constantly amazed at how every new painting becomes a voyage to discover the unique atmosphere and mood of a place. His aim is to capture light and ‘ambience’, rather than slavishly copying details from what is before him. Martin works from careful observation, sketches, photographs, memories and the painter’s greatest asset-informed imagination. Martin Bullivant's style ranges from very loose and impressionistic to a more figurative approach, as he feels the subject requires. Martin Bullivant acrylic on board "Gateway to the sea"
Martin Bullivant acrylic on board "Les Mielles Summer"
Martin Bullivant acrylic on board "St Brelade & Ouaisne"
Martin Bullivant acrylic on board "walking in St Brelade's Bay"
Martin Bullivant acrylic on canvas "Time to Move the Flag"
Martin Bullivant oil on board "August Fire"
Martin Bullivant oil on board "Breaking Winter Light"
Martin Bullivant oil on board "Cooling Off, Le Braye"